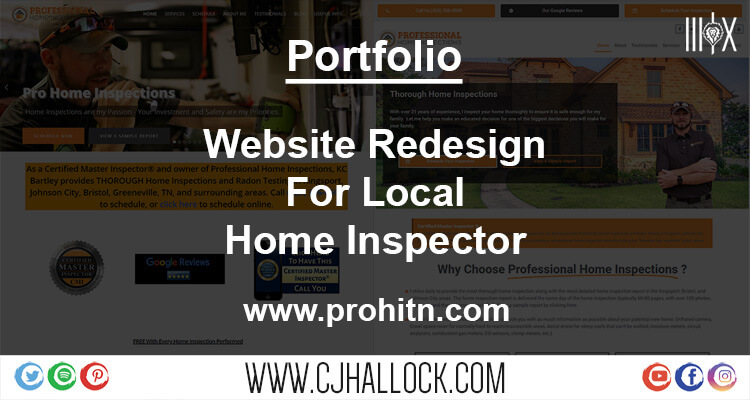 KC reached out to me originally to help with the optimization of his images for mobile compatibility, search engine optimization and a few other needs for the website he had for his business, Professional Home Inspections. After a few brainstorming sessions, we agreed on some major changes. I restructured the process of his users/visitors and did a complete redesign of his website. Through the process, I was able to keep his original needs in mind and lowered the size of his home page alone by over 50%, while able to maintain a cleaner look and a website that is easy to use for his customers. Including on page SEO services, marketing strategies, graphic design and a few other things, I was able to give him the website he deserved. “CJ has done multiple projects for me over the years and each time I have been impressed by both his talent and work ethic. He’s done backend SEO work, full website design, business card and marketing materials design and printing, and on and on. On the last project, he completed for me his work easily surpassed a national graphic design company I had used for a similar product previously.